Tens of millions of registered voters did not cast a ballot in the 2016 presidential election, and the share who cited a “dislike of the candidates or campaign issues” as their main reason for not participating reached a new high of 25%, according to a Pew Research Center analysis of new Census Bureau data. In other recent presidential elections, the share of registered voters who said they didn’t participate because they disliked the candidates or campaign issues was considerably lower. In 2012, for example, 13% cited this as their primary reason. In pre-election polling last year, registered voters expressed far lower levels of satisfaction with their choices of candidates than in prior elections over the past several decades. 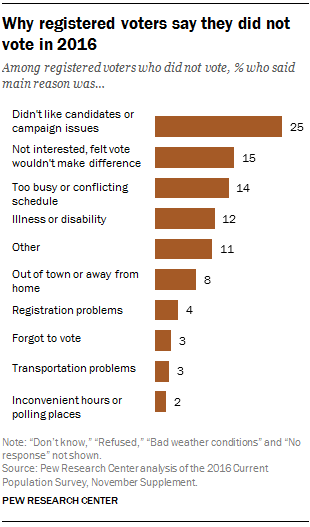 While a dislike of the candidates or issues was the most frequently cited reason for not voting, other top reasons included a lack of interest or a feeling that their vote wouldn’t make a difference (15%), being too busy or having a conflicting schedule (14%), having an illness or disability (12%) and being out of town or away from home (8%). Another 11% gave other reasons. The share who said they were too busy or had a conflicting schedule in 2016 – the most common reason given in previous elections – was down from 19% in 2012 to 14%. The share saying they did not vote because they were not interested or felt their vote would not make a difference (15% in 2016) changed little from the last presidential election. The surge in nonvoters who cited not liking the candidates or campaign issues as their reason for not voting in 2016 extended across all major demographic subgroups. For every major racial or ethnic group, the share of nonvoters who cited a dislike of the candidates or issues as the main reason for not voting rose sharply from 2012. Among black nonvoters, 19% said they did not vote because they did not like the candidates or campaign issues, up from just 3% in 2012 (when then-President Barack Obama was on the ballot). That share was equal to the share of black nonvoters who cited not being interested or feeling that their vote would not make a difference. Among Hispanic registered voters who did not vote last year, one-quarter cited not liking the candidates or campaign issues as the reason for not voting, up from 9% in 2012. Similarly, higher shares of nonvoting white and Asian registered voters gave this reason in 2016 than in 2012. When looking at generational differences, nonvoters in all generations were more likely to cite dislike of candidates than in past years. 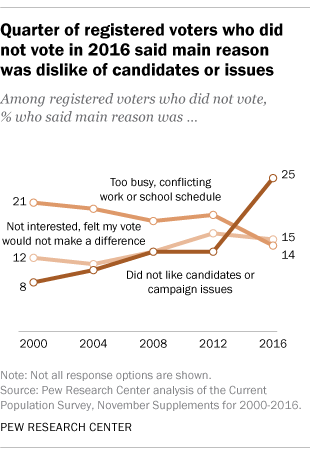 About three-in-ten of both Generation X (27%) and Baby Boom (27%) registered voters who did not vote in 2016 cited “not liking the candidates or campaign issues” as their main reason for not participating in the election. About two-in-ten Millennials (24%) and those in the Silent/Greatest generation (19%) said the same. For nonvoters who are foreign-born U.S. citizens, the share that was dissatisfied with the candidates or campaign issues in 2016 nearly tripled, from 8% in 2012 to 22%. Among U.S.-born nonvoters, this share increased by 12 points – from 13% in 2012 to 25% last year. The 2016 election stood out because the racial and ethnic diversity of voters did not grow for the first time since the ’90s, despite the fact that the overall eligible voting population was the most racially and ethnically diverse ever. Blacks, Hispanics, Asians and other racial minorities accounted for 27% of voters in 2016, a share essentially unchanged from 2012, according to the Census Bureau. At the same time, minorities made up a larger share of nonvoters in the 2016 election. In 2016, minorities made up a third (34%) of all nonvoters, up from a quarter in 2012.